Back to Fact-Link's Top Page > Machining > CENTRAL PRECISION PARTS CO., LTD.
We are proud of announce that new factory has just been kicked off in Aug, 2011 at Pingtong I/E for further business expansion accompanied by strengthening QCD control as we as work as one. 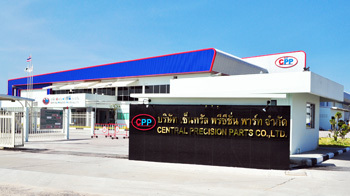 Back to 1996, CENTRAL PRECISION PARTS CO.,LTD. was established to manufacture and sell precision parts for compressor and etc. As is widely know, the compressor functions as the heart of cooling devices, and the valve plates of the compressor may be linkened to the valve of the human heart. We ardently hope that you will consider our valve plates which will surely serve the purpose of your company. CASIMA TRADING (THAILAND) CO., LTD.